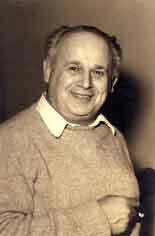 Moshe Feldenkrais (1904-1984). The Method was developed by Moshe Feldenkrais, DSc (Doctor of Science, Sorbonne) — engineer, physicist, martial artist, and pioneer in human deveopment. He authored many books that among the first to explore the study of the relationship between consciousness and movement. The breadth, vitality and precision of his work and Method has seen it applied in the fields of rehabilitation, neurology, psychology, performing arts, and sports. Bottom left: Feldenkrais in middle age; Middle: Teaching in San Francisco in 1975 with anthropologist Margaret Mead and Stanford neuroscientist Karl Pibram, Right: Feldenkrais with skeleton 1975. These photographs courtesy of Michel Silice-Feldenkrais. They are copyright. No reproduction in any media without permission. Thank you. Moshe Feldenkrais was an engineer, physicist, inventor, martial artist and student of human development. Born in the Ukraine, he emigrated to British Mandate Palestine as a young man. Later he studied at the Sorbonne and worked in the Joliot Curie laboratory in Paris during the 1930s. His interest in Ju Jitsu brought him into contact with Professor Kano who developed the sport of Judo. Dr. Feldenkrais was a founder of the Ju Jitsu Club of Paris and was one of the first Europeans to earn a black belt in Judo. Escaping the Nazi advance he went to Britain and worked on anti-submarine research for the Admiralty. It was there in the 1940s that he began to develop his Method and wrote his first book on the subject. A knee injury, and uncertain prospects for surgery, began Feldenkrais on what was to become a life long exploration of the relationship between movement and consciousness. Dr. Feldenkrais authored a number of seminal books on movement, learning, human consciousness and somatic experience. He taught in Israel and many countries in Europe through the 1960s and 1970s and in North America through the 1970s and 1980s. He trained his first group of teachers in Tel Aviv in the early 1970s. This was followed by two groups in the USA - one group in San Francisco and another in Amherst, Massachusetts. In his life Dr. Feldenkrais worked with all kinds of people with an enormous range of learning needs – from many infants with Cerebral Palsy to leading performers such as the violinist, the late Yehudi Menuhin. He taught over a number of years for the dramatist Peter Brook and his Theatre Bouffes du Nord. He was a collaborator with thinkers such as anthropologist Margaret Mead, neuroscientist Karl Pribram and explorers of the psychophysical Jean Houston and Robert Masters. First published on the website of the International Feldenkrais Federation. Another concise bio Feldenkrais biographer Mark Reese can be found at http://www.feldenkrais.com/moshe-feldenkrais. Volume One of Reese's biography, Moshe Feldenkrais: A Life in Movement can be purchased from Feldenkrais Resources.